In southern and eastern Ohio, spring systems are the most often developed water sources. Springs can provide adequate, low-cost, low-maintenance water systems. Water quality and quantity are major considerations when developing a spring. The first question to answer concerning spring development: Is this site worth developing? If a spring is not running in July and August, it may be an intermittent spring and would have limited production. Creating enough storage capacity for a poor-producing spring can be costly. When possible, attempt to develop springs at high elevations, this would allow the spring to gravity-flow to lower tanks, potentially supplying water to many paddocks. There are many water tank options, whether pressurized or gravity systems. The correct tank to use depends on the livestock species and the time of year you want to provide water. You can find many suggestions for planning travel distance to water but in general, less distance to water equals better pasture utilization and less reserve volume needed in the tank. Often we set a goal of 600 feet or less to water, and less is best. Used, heavy earth-moving tires are frequently used as water tanks and can be relatively inexpensive and freeze-resistant. Plan the livestock rotation system identifying the areas of the farm where freeze-proof systems will be needed. Winter watering systems vary in susceptibility to freeze. Many frost-free waterers use geothermal energy to keep the system from freezing, and the resistance to freeze varies in each. Water systems should have the ability to be drained, with lines that can be easily shut off. Cost to develop a spring will vary greatly and can range from $2,500 to $3,000 per spring or more depending on the tank selection. If concerned about the quality of the water, have it analyzed before development. 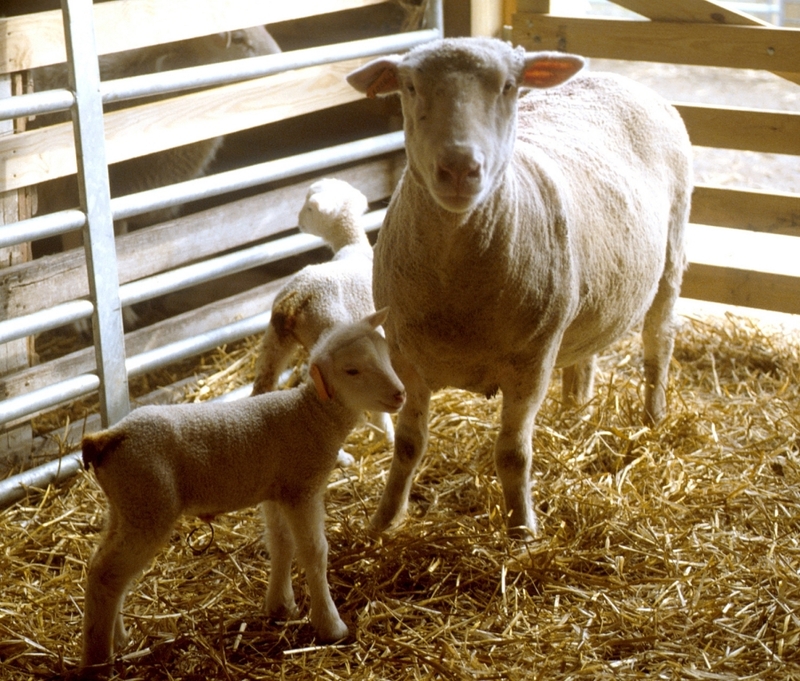 Your local OSU Extension office can provide laboratories capable of analyzing livestock water. Where there are no springs, ponds are often used as a source for livestock water. Livestock owners desire ponds as a watering source, partially because they also have a recreational-use value and can provide ample water any time of year. However, soils, drainage, and cost can limit the practicality of ponds. We have plenty of examples of poorly designed ponds that do not hold water due to limitations in soil resources, and we have ponds with poor dike and overflow designs that become severely damaged in rain events. If you think a pond is what you need, contact your local soil and water conservation office for advice before construction. Ponds may be completely fenced off from livestock, with piping used to deliver water. The best water in a pond is located near the center and about 2 feet below the surface. Granting livestock unlimited access to ponds and streams can cause bank erosion and water quality issues. For streams and ponds, consider developing limited water access points utilizing fencing, geotextile fabric and stone. As with springs, water quality can be an issue when utilizing ponds and streams. Plan your water distribution systems in conjunction with paddock development so that multiple paddocks will have access to one water system. The best advice in developing your water is to visit farms that have well-planned systems. When observing various farm systems, pay attention to shut-off locations, tank valve systems, overflow construction, paddock utilization and ground stabilization around the tanks. Your job will be to select the best features from these working examples to implement on your farm. For help in designing a livestock watering system contact the local USDA Natural Resources Conservation District Conservationist. Your NRCS office may also have cost-share incentives available to farmers that can help in reducing the expense of your livestock watering system. They can also provide farm-implemented examples of properly designed systems for you to view prior to construction. There is a lot more to cover related to water systems, such as construction, installation, calculating supply needs, pipe type, sizing, pumps and connections. When you set down with a professional at NRCS, the best options for these easily overlooked areas will be recommended. It is costly to build a water system twice. Take your time, do the research, keep it practical and economical, view examples and sit down with the folks at NRCS and plan the system. Posted by Braden Campbell at 8:00am January 4, 2019 Posted in Forages and Pasture and tagged Economics, Forages and Pasture, Management. Bookmark the permalink. ← Don’t Guess, Forage Test!